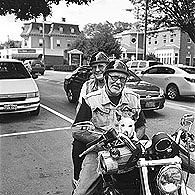 Robert Cantius spent nearly 60 years performing his "photographic anthropological study," which extended from his hometown of Paterson, New Jersey, through small cities and towns of western Massachusetts (Holyoke, Springfield, Turners Falls, Shelburne Falls, Greenfield, and Northampton), and then further north to Brattleboro and Bellows Falls in Vermont. Born in 1938, Cantius spent 25 years teaching art, graphic design, photography, and filmmaking at the elementary, high school, and college levels. A selection of Bob's iconic black-and-white photographs will be on display at the Whetstone Station restaurant and brewery for the month of March 2019. Inquiries can be sent to the Vermont Center for Photography—www.vcphoto.org. 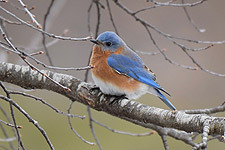 David Parker is a retired educator and a photographer with a lifelong interest in birds and other wildlife. His photographs, which have been displayed at numerous galleries in southern Vermont over the past two years, capture in stunning focus the beauty, intricacy, and grace of the natural world that surrounds a small pond on his property in Brookline, Vermont. The latest collection will be showing in March and April at All Souls Church, 29 South St., West Brattleboro. The public is invited to an opening artist's reception on Saturday, March 2, from 2:00 to 4:00 p.m. Hours otherwise are 9:00-12:00 weekdays, during worship services and other public events in the building, or by appointment; 802-254-9377. 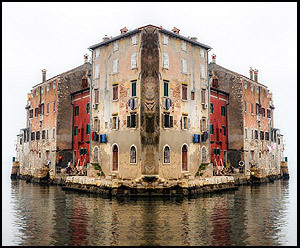 Gene Parulis: Visions and Explorations is featured through April 14 at Mitchell·Giddings Fine Arts, 183 Main St., with an opening reception on Saturday, March 2, 5:00-7:00 p.m. Gene has been photographing the world for fifty years. The two poles of his life are teaching and traveling, and photography occupies a central place in both. Artist Talk: Sat., March 23, 5:00 p.m. Gallery open Wed.-Mon. 11-5. "Perhaps my Gemini status goes part of the way in explaining the divergent approaches my photography takes. I work comfortably in both realist and surrealist worlds and find each to be inspiring. In two scenes from Guangzhou, China, my intention was to offer a vivid sense of place, in this case, the narrow lanes of the Xiaobei district, dark and medieval but with all the improvised, miraculously functional tangle of the twenty-first century. The images question how we human beings create and maintain these seemingly impossible densities of congregation. "The three surrealist images in this exhibit are completely different ways of perceiving. Since childhood I've been intrigued by the idea of a parallel universe, something I could readily observe in mirrors and windows, where one world reflects the other and both, if held in a unified vision, are altered. I wanted to venture into the implicit "what if?" of the alternative side of the looking-glass and see what is there. What continues to fascinate me is the rich seam, the liminal zone where the images coalesce. When parallel patterns meet, their threshold of interpenetration opens into wonderfully strange new worlds, surprising, arresting, haunting, yet fundamentally satisfying."